I now have so many pencil sets and cases, I thought maybe tags will help me grab the right pencils for the right project. (A girl can hope, right?) Since it’s also new-release day at Purple Onion, I used the new Stacey Yacula stamps to make the tags. Watch the video below or click HERE to see it in HD on YouTube. I made cards with some of the new release stamps too, so you can see them a tidge better. Little sleeping mouse under the stars has a pillow I drew so he’d be comfy while napping under the stars. And of course – a puppy had to look like my dogs, right? I decided the floppy ears suited Vienna best; she’s been voluntarily sitting “up” with her paw reaching out on her own lately – even without a cookie dangled to entice her! 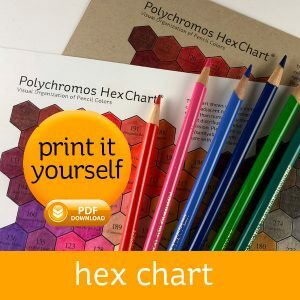 At long last…the colored pencil hex charts! And Colored Pencil Jumpstart Class is open for pre-registration – preclass videos are there, supply lists are there…and I’m madly working on shooting and editing all the videos for class. It’ll all be done and ready soon, but I figured you guys could get busy prepping for class, getting charts colored, etc. Enjoy! And be sure to share with your friends – I know a lot of pencil folks haven’t been following me, since they figured I’d never get into pencil at this level. LOL. NOTE: THERE WILL BE NO WATERCOLOR OR WATERCOLOR PENCIL CHARTS. (Sorry for the all-caps but this post has generated repeat questions in both comments here as well as all over social media.) Watercolor and watercolor pencils need WATER. Printers usually can’t deal with watercolor paper – ink flakes off. And it’s not waterproof. Please understand that if I find a way around it I will. But for now – no. Colored Pencils: Choose one brand, or try the class with another you own. RYB are listed in case you wish to try out a brand. Stonehenge DB | AMZ – HIGHLY recommend trying this paper. I am wondering if you plan on showing how to color flowers, in this lesson or a future lesson. Hi Sandy, I am very much into this class but I am disappointed that the images are not something available to me in Australia. I would appreciate you using floral images from Power Poppy or Altenew which I can buy. I love stamps and the Purple Onion ones are just not available or what I really want or am inspired by. Is it too late to include them? Totally jazzed about the colored pencil class!! YIPPEE! Almost wanna skip! Do you have a list of colors or the numbers you will be using in the class for each of the pencil categories? Or just some of everything? i actually don’t give #s in this class for anything. Everyone’s using different sets, so you’ll be looking for a medium blue or dark green in your collection. No watercolor hex charts are coming. Watercolor paper won’t go through printers, and printer ink isn’t waterproof. Please, pleeeeze do a Daniel Smith watercolors chart. Pretty please? No water based mediums. You can’t print on watercolor paper, and toners are not compatible. I’m so looking forward to this class!! I have one question, do we need to purchase all the stamps or just pick our favorite? I listed two groups of stamps – one that’s highly recommended, the other is optional. If you have stamps that look like any of them, or images that’ll work with the technique once you see it, you can of course use anything. Some artists will take the class and not stamp at all – just draw their own pictures. Thanks for the info Sandy, I’m really really looking forward to your class, I’ve been looking for something like it for a while. Although I’ve been shopping at Purple Onion, I’m short of the sort of stamps that you used, and I’m no artist! I enjoyed looking at a ‘new to me’ Stamp supplier especially as they supply red rubber stamps. I appreciate you trying to keep the costs as low as possible, so often with classes elsewhere , I’ve decided not to sign up with them because the supplies list was a years wages! (Or (so it seemed) So although I’ve bought some of the images, I feel as if what little I’ve spent so far is going to be money very well spent, on supplies and knowledge that will stand me in good stead for many years to come. Thanks again Sandy, roll on the 15th! Hi Sandy, you mentioned two groups of stamps. Purple Onion is one but what is the other. The recommended vs optional stamps. All from one company. Very excited to take your class, Sandy! I used PayPal , but haven’t received a confirmation from you. Hope my enrollment was confirmed. I am signed up and ready to go, so excited! Was given a complete set of Polychromos lately and really wanting a pencil class so I literally jumped when I saw you are offering one. 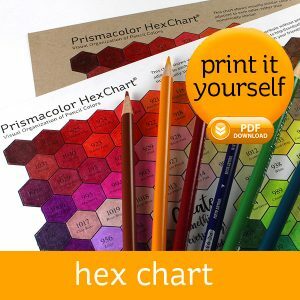 I have downloaded the Hex chart and printed in several colors, busy filling them in and cannot wait to start! I also took your recommendation and bought a pencil case – will come in very handy for travel. 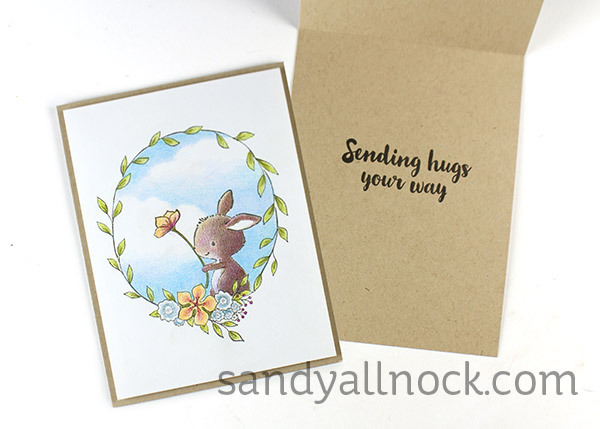 Really great cards Sandy! And I’m looking into the class now! I have a full set of Prismacolours that Iv’e never used! I’ve been hoping you would eventually do a coloured pencil class, I’ve signed up, got the charts, been shopping (oh those Red Onion Stamps!) and now I have to be patient, wait for my goodies to get all the way here to me in New Zealand and wait for class to start, good job I’ve got charts to colour to pass the time ‘cause that waiting isn’t going to be easy lol! Thanks for organising this class, I’m certain you’ve made a lot of people happy! I can do a colored pencil class, yeah! and the pencil case tags are so very clever. thanks as always for sharing. 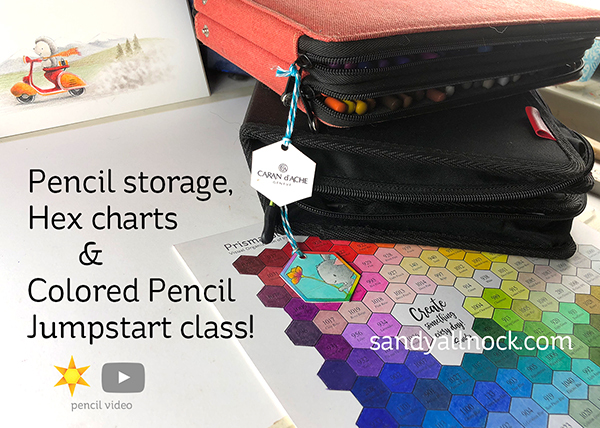 Thanks Sandy – I bought the Prismacolor hex chart as that is my pencil of choice. I really appreciate all your hard work for us!!!!! You are awesome! Sorry Sandy I’ve got a problem with the AMZ links, don’t know why, put it down to British weather but I can’t get any of the links to open so I’m having problem seeing which Stonehenge paper as there are 4 different and they are costing £30 plus £10 shipping . I don’t want to buy the wrong one at those prices. I’m so sorry to ask. Likely because they don’t let you get to the US Amazon site? It’s the one with the green cover. Oh Sandy you know I love you to bits any way but today I love you so much more, colour pencil classes yeeessss ! I have Crayolas still and I love them still. Definitely going to have to save for this class as my pencils are my favourite. Will everything have to be blended, even hex charts ? I am totally excited about these!! 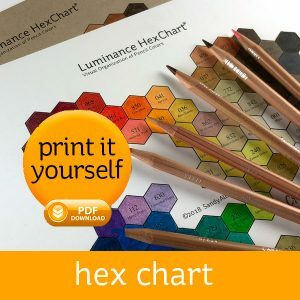 I love my Polychromos and Caran D’Ache Luminance pencils and now I can have Hex Charts on all the papers I color on, YIPPEE!!! Thank you so very much :)!!! Oh wow, I’m excited too! I couldn’t wait and got all three hex charts immediately! Thank you so much! Thanks so much for the Prismacolor Hex Chart!!! I really enjoy and appreciate all you do for us! Exciting! Any chance you might do a bundle for all 3 pencil hex charts please, please? I surveyed a bunch of people and was told few peeps were gonna have them all, so I wouldn’t have to figure out how to set up a bundle – LOL.